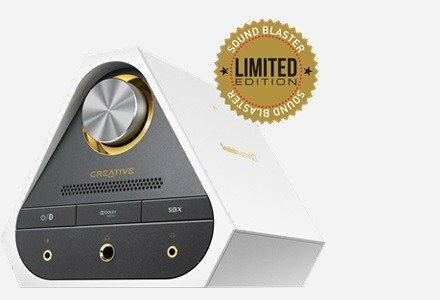 The Sound Blaster E3 is a headphone amplifier that gives you high audio quality performance with music streaming wirelessly to your smart mobile devices. It supports USB audio streaming from the smart mobile devices as well, providing a higher grade of quality than Bluetooth. Introduce Life To Your Audio. Tired of flat or underpowered audio playback from your smart device, while on the go? Attach the Sound Blaster E3, and what you get in return is an increased level of audio detail & resolution previously unreachable by your smart device. 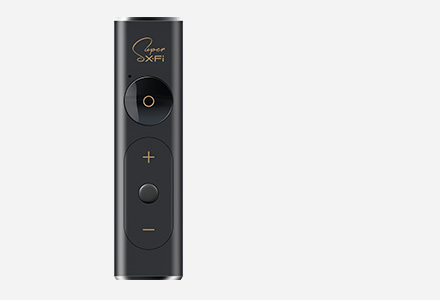 Reward your ears with jaw-dropping audio fidelity of 112dB (DAC) Signal-to-Noise Ratio (SNR). In comparison, Compact Discs (CD) has about 98dB SNR. 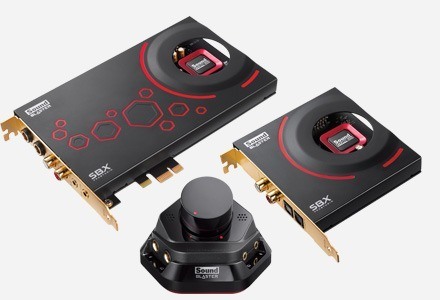 The built-in headphone amplifier supports up to 600ohm, so there are no limits to the type of headphones you can pair with the Sound Blaster E3. Free up your phone. 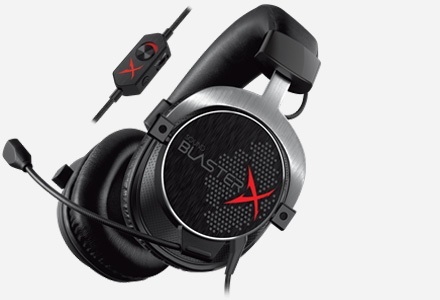 Music is streamed via Bluetooth (without wires) to the Sound Blaster E3. So even if you chuck your phone into your bag, you can control the music playback, as well as the volume, remotely via the Sound Blaster E3. When a phone call comes in, a simple press of a button on the Sound Blaster E3 allows you to answer the call. Awesome! The built-in microphone provides the additional benefit of using your normal headphones for conversations over the phone. When connected to PCs and Macs via USB, you can activate the CrystalVoice Technology, a suite of enhancements that reduces noise and provides for clearer conversations. The Sound Blaster E3 is small and light, at only 44 grams. This means it can be easily carried around in a bag or a pocket, or clipped onto clothing. No longer will you have to haul a headphone amplifier the size of a brick to enjoy better audio. For Quality Digital Audio On-The-Go! Sound Blaster E3 functions as a portable USB DAC, which means you can connect it to selected smartphones or tablets via USB cable* for uncompressed digital audio streaming. Sharing is easy with the Sound Blaster E3 which comes with dual headphone output jacks! Unlike other shared outputs, the Sound Blaster E3 does not compromise on audio fidelity, even when powering two discrete headphone outputs! Sound Blaster E3 performs up to 8-hrs1 per charge via Bluetooth or 17 hours via analog audio playback, so needless to say that should be the last thing you should worry about. Plug the Sound Blaster E3 to your PC or MAC via USB connection, and it becomes a high performing portable Digital-Analog Converter (DAC) capable of 112dB (DAC) Signal-to-Noise Ratio (SNR). With SBX Pro Studio technology and connected to PCs and Macs, you can further adjust what you listen, to your individual taste. Connect the Sound Blaster E3 to your PC or Mac via USB connection, and fire up Sound Blaster E-Series Control Panel. In the SBX Pro Studio menu, enable SBX Surround to adjust the immersion level of surround sound that you really like. You can also increase the other parameters like Bass so your house rumbles. Simply enable SBX Bass and adjust the level and Crossover Frequency as you prefer. The detail in the audio was vastly improved with a full bass and airy audio that added life to the games I play. Of course, the amplification helped as well. The multitude of options and possibilities that it gives you is amazing since you can use it as a USB sound card one minute and the next be using it as a Bluetooth wireless receiver the next or have both so you never miss a important phone call while listening or watching something can be crucial. So who should get it? Well, audiophiles will love the idea of more power and the ability to achieve that certain sound quality you can only get from playing around with an equalizer. Tech junkies will get a kick out of how convenient the E3, and how convenient it makes life in general. Generally speaking, though, this is something that people who are always on-the-go will really enjoy. In summary, the Creative Sound Blaster E3 is a nifty and useful little gadget for both audiophiles and people who just want a louder, better quality audio experience. E3 gives superb sound quality when compared to a plain Audio Source which in my case are not bad in the first hand - Samsung Galaxy Note 4. I get the best Audio Quality so far when I combine the Note 4, the DFX Audio Enhacer (setting as Classical Music with flat EQ settings) and E3 via Bluetooth. 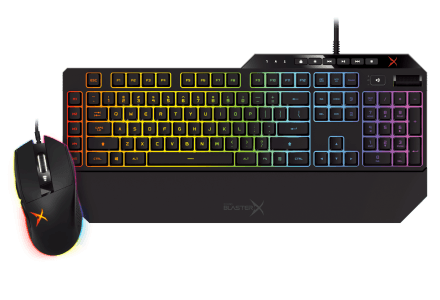 It will be better if the bluetooth capability of the device can be used to transmit sound to wireless headphones and speakers when connected to the PC as a sound card. The sound quality is great with the built-in amplifier. SBX Pro Studio improves the effects of sound as well. It is portable and makes it easy to improve the quality of your sound significantly. 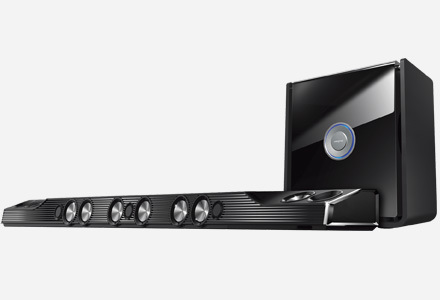 Amaze by its functionalities and the sound quality! I am very happy with the product. It is easy to use and my music get noticeable louder and clearer; it's not a volume factor but the overall quality of the music is better. 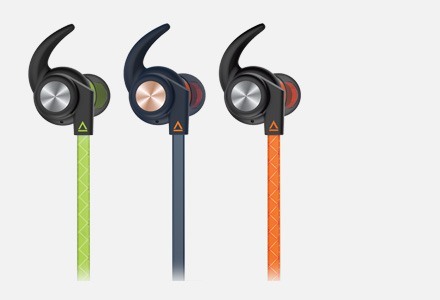 The bluetooth connectivity makes it smart and I don't need to fumble with my earphone wirings as much. Usually wear it during my commute for work.